It was a good start, but summer has been a relative waash-oot as they say in these parts. However, I am aware that we are faring somewhat better that our friends down south who have suffered daily deluges of Biblical proportions. A couple of weeks ago I spent some time at a conference for the National Institute of Medical Herbalists which was held at Woodbrooke Quaker study centre near Birmingham. North to some folks, that’s WAY down south to me. And what a very beautiful place Woodbrooke turned out to be. The Cadbury family home, set in large garden and woodland complete with pond (and boat – no, I didn’t but herbalist friends DID!). 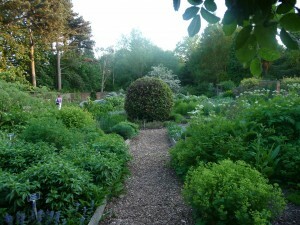 But it was the kitchen garden that fascinated me. Years of care for the plants and high walls creating a micro-climate mean that the specimens found within were, to put it bluntly, ENORMOUS and organic to boot. No miracle growth additives there, just love and care and great homemade compost. It brought home to me how intertwined our herbal medicine and our food really is, seeing them as lush and happy companions. So when I find myself turning to writing about food recipes more often than strictly medicinal ones, I no longer worry, but embrace the medicine of the kitchen!